In 2010, Israeli special forces illegally seized hundreds of peace activists from ships in international waters. They took them by force to Israel, held them incommunicado and then pulled out the stops to persuade global news organisations to accept their version of this act of piracy. Penny Cole reports. The Israeli Information Directorate is a sinister counterpart to George Orwell’s Ministry of Truth in his novel 1984. Orwell’s ministry is a misnomer that serves exactly the opposite purpose. In Israel’s case, information becomes absolute disinformation. After the seizure of the activists, the Israelis issued the world’s media with a film claiming to show what had taken place. What they didn’t acknowledge was that they had stolen film from the prisoners, and re-edited the sequence of events. They left out crucial moments – for example when Israeli soldiers were shooting people down – and put their own captions with their own explanations of what was happening. Serious journalists would normally have rejected such a fraudulent product – but not in this case. It was uncritically broadcast by news organisations across the globe, with only a few explaining its actual status. When the activists were finally released, and told their story – that the Israelis boarded the boat shooting, that they executed five Turkish activists by shooting them in the back of the head – this was reported as “some protesters disputed the Israeli version of events”. And of course they had no “proof” because the Israelis stole their cameras. In this hard-hitting update of the 2004 study Bad News from Israel, the Glasgow Media Centre’s (GMC) exposes blatant media bias against the Palestinians and Israel’s stunning success in manipulating UK coverage of both the Gaza Peace Flotilla in 2010 and the 2009 attack on Gaza. Author Greg Philo, speaking at the Glasgow launch of More Bad News from Israel, said whilst the terrible casualties and horrors in Gaza were right there on our television screens, GMC’s research showed most people continued to blame the Palestinians for their own plight. And that, he says, is because whilst Israel could not control the pictures they successfully controlled the history and context reported. They presented a “tightly-packaged set of explanations”, which they repeated ad nauseam, and which were reported daily and uncritically in the media. And as a result, unlike in other wars – Vietnam, Bosnia or Darfur for example – average people saw the horrors on their TV screens and still blamed the victims. In advance of the 2009 attack on Gaza, which Israel plotted and planned specifically to derail any pressure on it to make a settlement with the Palestinians, the newly-formed Information Directorate launched the so-called Israel Project. Working with top PR agencies in the United states, this set out to rehearse and role play and hone a set of simple lies – that Hamas broke the ceasefire, that the Israeli assault was on Hamas not the people of Gaza, that it was in response to rockets fired into Israel, that Hamas is a terrorist organization not a government, that Hamas wants to drive Israelis into the sea and that it was using civilians as a human shield. Every one of these propositions is exploded in the GMC’s updated history section, which offers a balanced perspective from both sides. The authors quote Ephraim Halevy, former head of the Israeli intelligence service Mossad, saying the Israeli government “could have stopped the rockets months ago by lifting its siege of Gaza”. And they cite a range of sources confirming that Hamas had accepted the continuing existence of the state of Israel within its pre-1967 borders months before the attack on Gaza. And that is exactly what UN resolutions, and now President Obama, have called for. None of this was reported at anything like the length or frequency of Israel’s manufactured reality, and the GMC is able to quantify this disparity in coverage. The publicly-funded BBC is particularly damned because it claims to offer “balance”, because people rely on them and because an independent report to the Corporation’s governors in 2006 clearly identified a failure to present the Palestinian side of the story and called for an improvement. In spite of all that, the GMC report shows how news programmes continue to allow Israeli government media experts to manipulate them. Through a series of focus groups and surveys, GMC highlight the outcomes – a clear relationship between people’s understanding of the Palestine conflict and the way the news is reported. People use the same words and phrases. For example when a 12-year-old Palestinian child was shot, they used the phrase “caught in the cross fire”, when in fact eye witnesses said he was deliberately shot down. The gaps in people’s understanding reflect the gaps in the reporting. People hear “occupied territories”, but most don’t know who is the occupier. Many think it is the Palestinians and of those who know it is the Israelis, many don’t realise it is a military occupation. Settlers are presented as vulnerable and under attack not, as Israeli historian Avi Shlaim puts it, “part of a policy of exerting strategic and military control”. Viewers imagine peaceful religious people – not fortifications, armed to the teeth. It is rarely reported that the settlements now control 40% of the West Bank, with intensive farms and industrial zones worked by low-paid Palestinian workers. Incredibly, many people think Palestine is a state with a huge army and that there are invariably more Israeli than Palestinian deaths. If people were given a brief account of the history not only would they watch the news but it would mean more to them, the focus groups showed. As one interviewee said, the way it is presented is “this fighting is due to yesterday’s fighting, which was due to the day before”. The GMC report quotes Leon Barkho’s “discourse analysis” of the words used by reporters. Israelis “confirm” what happened, Palestinians only “claim’” the Israeli soldier Gilad Shalit was “kidnapped” from the “Israeli” side of the “security fence”, but 60 members of Hamas including 30 MPs, dragged from their beds in the early hours of the morning by Israeli troops were “arrested”. During the attack on Gaza, BBC news reporters continuously referred to “a bombardment of Hamas targets”, an “offensive against Hamas”, while “day 10 of Israel’s assault on the Gaza strip and its Hamas fighters is coming to an end”. Hamas responds to Israel’s claim that the assault has had the desired effect by “promising to continue what they call their resistance”. Just weeks ago, when reporting the attempt by some Palestinian refugees to cross the Syrian/Israeli border to reclaim their homes, John Humphrys on the BBC Radio 4 Today programme stated “they believe they were driven out of their homes” in 1948. But it is not a question of “belief” but of history. Many of those present were carrying the title deeds to their homes, and family photographs taken in their homes, gardens and villages. Whilst this reporting drives many of us to blind fury, the authors point out the importance of going beyond the words to relate the reporting to the underlying assumptions and legitimacy given to the two sides. “The political status of Israel plus its extensive public relations activity means in practice that its explanations and rationales are more likely than those of the Palestinians to underpin the thematic structure of the news,” they say and “news is organised around coherent ways of understanding”. GMC are right that we need to go beyond the words to the underlying assumptions; but we also have to go beyond the assumptions and conscious distortions to the reactionary political interests they represent in the United States and Europe. If media analysis and focus groups were held in the Arab world a different picture would emerge. The Arab Spring is already transforming the presentation of the Palestinian’s cause and extending the social networking revolution. The Gaza Youth Breaks Out Facebook page rapidly gathered friends and helped force Hamas and Fatah to come together in a new alliance. And of course, Israelis more or less know the truth about what is really going on and draw their own conclusions – either accepting the brutal occupation as necessary or allying themselves with liberal or radical opponents of the Israeli state. A good example of a change in reporting and public discourse in Israel itself is this skit from the comedy show Wonderful Country. It depicts an education programme devised to prepare kindergarten children for life in Israel. Thousands of Israelis watch it on You Tube time after time. 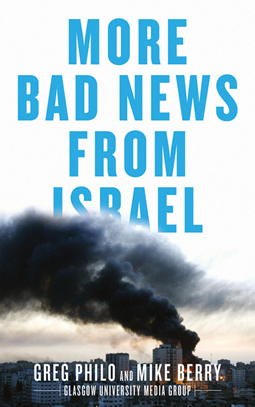 More Bad News from Israel by Greg Philo and Mike Berry, Glasgow University Media Group, Pluto Press, £15.